Given the vast destruction wrought by the earthquake and tsunami on 11 March 2011 and given the threat of a nuclear disaster caused by the destroyed nuclear power plant in Fukushima I, the FAU-IWA launched a solidarity and aid fund for precarious workers in Japan - the "Freeters Solidarity Fund". As an anarcho-syndicalist grassroots trade union, our first concern is the many precarious workers (Freeters), who were excluded even before the disaster, often forced into appalling working and living conditions. It calls for donations for the relief and solidarity fund whose resources are to be used in close consultation with the "Freeters Zenpan Roso," a self-organized group of precarious workers in Japan. Postbank Hamburg (BLZ 200100 20) under the codeword "Freeters". Every little contribution is welcome as an expression of living class solidarity. their numbers exploded. There are hundreds of thousands among them, somehow getting by from one low-paying job opportunity to the next. Many are young, many are educated. They are socially stigmatized and marginalized, often crammed together in barracks on the outskirts of large cities, many homeless. Some of them call themselves "freeters", an invented word, a contraction of "freelancers" and "Arubaito" (from the German word for work), a Japanese term for day labor or temporary work. Freeters are also recruited in Japan as "disposable workers" who do dirty and work for a minimum wage. Also among workers who are currently trying to contain the disaster caused by the destroyed nuclear reactors at the Fukushima nuclear power plant you should find "disposable workers". For several years, Freeters have been trying to organize themselves in trade unions and get out of the hellish exploitation and social exclusion. Why the solidarity and aid fund? Some may wonder why we have launched an independent aid and solidarity fund in support of Freeters. We have done this because we know from past experience that in the face of disaster, not all are equal. If you have money or influence, you have more ways to cope with the consequences. Those already destitute and in the margins of society face a much more difficult situation in the event of a natural or man-made disaster. This is how disaster management looks under capitalist conditions. We understand the fund as a direct act of solidarity among workers. We know that given the scale of the disaster and in view of the nuclear threat, what we can do is still too little. 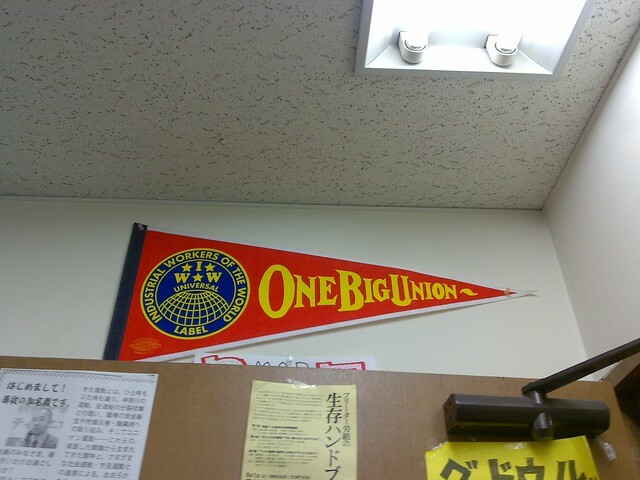 But we will not forget that Freeters went to the streets in different Japanese cities in 2010 to support FAU's industrial action at Kino Babylon Mitte and the threat of the de facto banning of the union. What should the money be used for? We will decide on the use of the money based on our existing contacts and in consultation with organizations of Freeters like the "Freeters Zenpan Roso." How that will look in any particular case will depend on how the disaster develops. It is possible, for example, that part of the money be used, given the deteriorating food supply situation, to purchase and distribute food. In the event that the radioactive contamination spreads further, prices for less contaminated food will rise in the future. Here too support might soon be necessary. There are even Freeters who want to leave or go to less affected parts of the country to live in safety. For many of them there is the matter of money for transportation and accommodation. We have already started to support Japanese comrades there. 1. For current information about the "Freeters Solidarity fund" we have set up a special page. There we will inform people over the next few weeks of the status of contributions and current developments relating to the Fund.